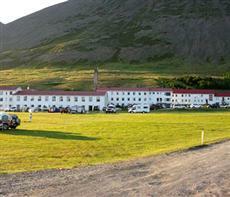 Hotel Napur is the perfect place to stay for an exciting vacation in Iceland. It is located in the Westfjords, where you can view fjords, the sea, amazing wildlife, and beautiful plants. The town of Isafjorður is a very traditional fishing village. Hear guests can experience how Iceland used to be, hearing the old tongue. Other sights include Skrudur, a botanical garden or Dynjandi, a waterfall in the area. Hiking, bird watching, sailing, kayaking, fishing, horseback riding, and golf are other ways you can spend your day. Hotel Nupur is located in the midst of the mountains and the sea in a group of buildings that was once a school. It is a great location for guests who wish to go for a stroll and watch the sunset in an untouched and pristine natural environment. Amenities at the hotel include a restaurant, where guests can dine on Icelandic cuisine, such as pickled sea trout with honey mustard sauce. There is also a bar, where guests can enjoy drinks and small bites. Other offerings include a swimming pool, a communal kitchen, and a banqueting service. Wireless Internet access is available.